Aimed at fun friendly adventure travelers, we offer simple and comfortable rustic accommodation including six budget dome tents, five cottages and two safari tents as well as having a large camping area if you come with your own tent. We provide clean facilities with hot showers, cozy bar and dining area with freshly prepared meals for our full board guests and a self-catering kitchen area for our guests who prefer to prepare their own meals. Our electricity is 100% solar with just a back up generator for bad weather days therefore we ask you to refrain from using hair dryers! We are a pet friendly camp with cats and dogs living onsite. From our base here you can partake in activities including game drives, nature walks, school and village visits, home stays, bush camping, horse riding and hot air ballooning. Located just 3.8km before the Sekenani gate of the Maasai Mara National Reserve and only 300m from the main road, we are accessible via public transport or we can organise you private transfers from Nairobi if you prefer which cost US$ 135 (1-4pax) or US$ 250 (5-12pax) each way per vehicle and the journey takes around 5 hours. We have Land Cruisers based at our camp for game drives which are converted for game viewing and are inclusive of an experienced driver guide and fuel. Game drives cost US$ 60 per person per full day ($65pp 2020 rate), minimum of 2 people required. In the event there are no other guests, solo travellers will be required to pay the rate of 2 people. Your personal park entry is payable on top which is US$ 80 per adult per day. Private use of a game drive vehicle for just your own group can also be arranged, contact us in advance for rates and booking. As well as plenty of space if you come with your own tent we have simple single and double budget dome tents which share communal toilet and shower facilities. We also have two double ensuite safari tents and various cottages which can sleep between 1-5 people in each with private toilet and shower attached. All our accommodation is complete with comfortable beds which have linens, blankets and towels included and the tents have solar powered lighting inside. Charging of electronics can be done centrally in our bar area. 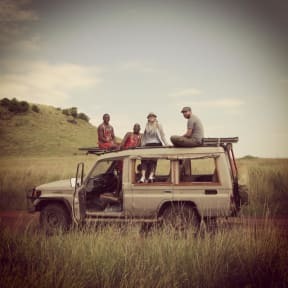 This is a fantastic place to be and the safari with them is well priced and excellent!!! I would recommend this place to anyone!!! We highly recomend this camp. The stars are the employees, they are really helpful. The place is nice and clean, and we had a gret time. It is also a great budget option for safari, you can go there with public transport (more on their web site) and a whole day drive will cost 60 $ plus 80 for the park. And they have great masai guides. If you go there, say hello to them all (including the dogs). Had an excellent time. Good food, great staff and nice atmosphere. If you are doing a safari on a budget, this is the place to stay! Awesome staff, cheap game drives, good food, and great drivers/guides! I’m really glad that I chose to stay here! Really nice to stay, close to Masai Mara, friendly and helpfully staff, the open kitchen has everything you need to cook, quite atmosphere, we could come back for sure, highly recommended. They helped us to find a safari with a really good guy and guide Joffrey!!! Thanks for all! Great place, tents were spacious and I liked the kitchen, the communal area (finally could switch my book, too!) and the showers were really hot and powerful, never had that in Kenya! And I really like the way they made this camp eco-friendly. This is a great place to stay - we felt very welcomed, the staff were all stars, and the game drives were amazing! Please bear in mind that it is outside the park so you have to get the $80 ticket each day you go in. The food was also tasty, especially the dinners. I had an AMAZING stay here! It's a pain to get here, but it's so worth it! The staff are all unbelievable friendly- within a few hours they have learned everyones names. The $60/person/day safari with Jeffery was truly the BEST safari experience i've had- truly a 5 star experience. The tents are quite fancy "glamping" tents with full beds inside. They also have really good, vegetarian-friendly filling meals for breakfast lunch and dinner for about $10usd... but you can bring your own food. This is easily the place to go for budget / DIY Masai Mara as its outside the park so only pay entrance when you Safari. 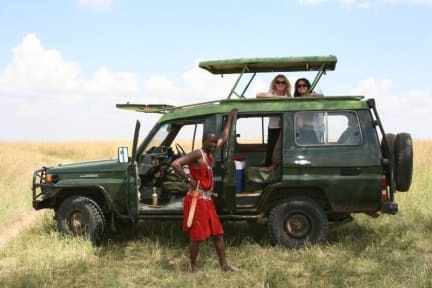 Being able to join a group for a full day Safari at 60USD is also extremely good value. The food prices are quite expensive and whilst they do a kitchen for self-catering it’s a pretty small, but you can still manage. Definitely recommended for DIYers.